‘“The works of Jonny Briggs often touch upon around the blurred boundary between the body and the landscape, a strange in-between state where bodies merge with their surroundings. “The gaps in history shout louder than the facts,” he explains. “I notice how we may project into these gaps our own fears or desires, generating stories that evolve into folklore, blurring the boundary between what is real, and what is fantasy.” This estuary of the natural and artificial is explored through the body of work he presents in The Manicured Wild. Briggs probes our need to create artificial versions of nature – as seen in wallpaper, greengrocer grass and laminates, or as smelt in air fresheners, perfumes and candles. For him, it is this phenomenon of nature, controlled, that enthrals him. 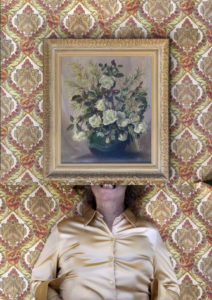 As such, his photographic works appear as if they have been digitally manipulated as montages of different visual realities, yet closer inspection reveals them to be more real than one at first assumes. The Hanged Man, for example, presents us with a kneeling figure, yet that is only part of the sum of the many parts he is composed of. His eye, like an Illuminati symbol, dominates the foreground, his body grey against the vibrant green of an unruly woodland. It seems like a clever trick of Photoshop, yet the more one looks, the harder it is to discern what is photographic montage and what may actually be real. 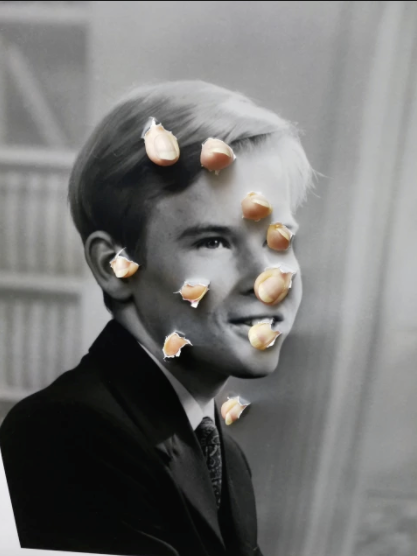 “I seek to create uncrackable puzzles, in terms of how missing parts in the photographs relate to the objects they are presented with,” he explains. “The object can’t complete the photograph; the photograph can’t complete the object.” As such, he works with the fragmented body; in particular those parts which relate to senses (eyes, nose, mouth, ears, hands), symbolic of the ways in which we recreate nature to our own tastes – artificial sights, sounds and flavours. Series such as Templates (comprising painted linoleum-flooring panels, polystyrene, foam and print), explore these notions of materiality, representation, visual appropriation and mimicry (in this case, of stone), and how they are re-appropriated into contemporary Western culture. Totems/Cairns, similarly, probes the cultural significance of stone and the relationship between social relics, sacred objects, and assemblages for pilgrimage – and how found and crafted objects are positioned as artefacts. The Manicured Wild will also involve a performance element, as Jokhova creates a giant rock sculpture, Sisypha. Strapped to a plywood board, it will be wheeled once a day up and down the gallery’s High Street, a metaphor for the human migration, for the struggle over land, finding one’s place, and how place can migrate within collective memory. The work also touches on the current plight of artists who are pushed of out cities due to gentrification and rise of property prices. “Referring to all types of migration, economic, political, geographic, historical, Sisyphais simultaneously ‘home’ and ‘no place’ being carted around,” says Jokhova. The Sisyphean feat of endless movement extends to the ceaseless tasks of gallerists who take on these artists and their baggage, taking it to and from art fairs, temporary commissions, sculpture parks and so on. Encapsulating history in stone, the work references the eponymous Greek tale, and the human plight of endlessly working to conquer nature (both human and environmental) and our constant striving to perfect ourselves – that endless, hopeless task of seeking to manicure the wild.